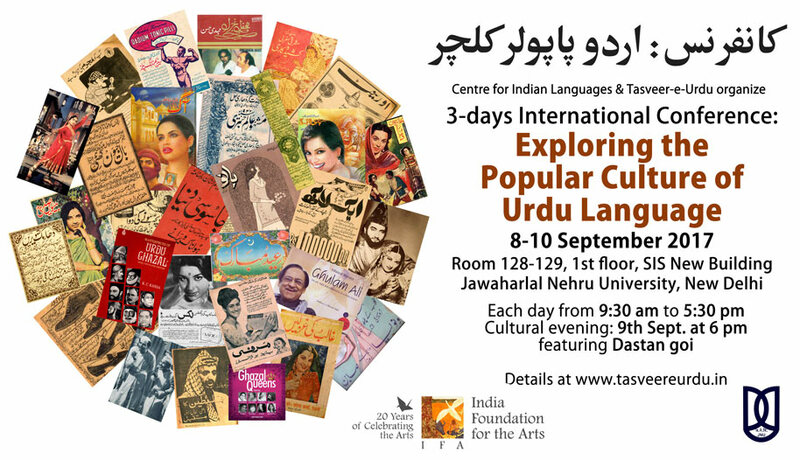 cordially invite you to attend a three-days international conference on Urdu’s popular culture. While Urdu is typically celebrated as a language of romance and classical poetry by Ghalib, Mir, and Faiz etc., its lesser-acknowledged popular culture of movie songs, detective fiction, ghazal gayeki, poetry inscribed behind vehicles, mushairas, and qawwalis, has probably kept the language alive and kicking among the masses even as its more virtuous practitioners lament that Urdu is dying in India. So what are these popular forms that continue to thrive in the underbelly of classical Urdu and how different they are from its elite cultural life? More importantly, where does one draw a line between popular and classical in Urdu? This and other pertinent questions will be explored in a three-day conference featuring many scholars from India and abroad. The conference each day will be held from 9:30 am to 5:30 pm, with a cultural evening on 9th September featuring a Dastangoi performance by Ankit Chadha, at 6 pm. Kindly see the schedule of the three days - If you need the printed brochure of the conference, kindly write to us. The conference is supported by the India Foundation for the Arts, Bangalore, under the Arts Research Programme.